Foreign Office Minister Jeremy Browne, Mexican Ambassador Eduardo Medina-Mora and senior speakers from NGO Reprieve and the Commonwealth Secretariat spoke at the event marking World Day Against the Death Penalty. Launching the UK Government’s strategy for Global Abolition of the Death Penalty, Minister Jeremy Browne outlined three main goals: to increase the number of abolitionist countries or those with a moratorium; to reduce the numbers of executions and further restrict use of the death penalty; and to ensure that where the death penalty remains, minimum standards are met. Watch the video below to see his speech. Read the full strategy for Global Abolition of the Death Penalty here. This week the Minister will answer selected questions on the death penalty via Facebook. 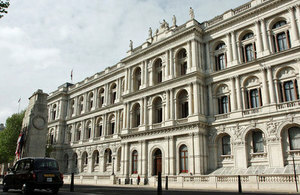 To ask your question please visit the Foreign Office Facebook page. At today’s event, Mexican Ambassador Eduardo Medina-Mora spoke about Mexico’s decision to abolish the death penalty in 2005. Reprieve Deputy Director for the Death Penalty Team Tineke Harris spoke about the NGO’s work on using the law to enforce the human rights of prisoners, from death row to Guantanamo Bay. Dr. Purna Sen Head of Human Rights at the Commonwealth Secretariat discussed the situation in the Commonwealth and how the UK and international community can pursue our human rights objectives through the Commonwealth. 10 October marked the seventh anniversary of the World Day Against the Death Penalty and the third anniversary of the European Day Against the Death Penalty. The UK is opposed to death penalty in all circumstances because it undermines human dignity.